In 1988 I travelled to visit a cousin who worked at the US Embassy in what was then East Berlin. My cousin lived in West Berlin, which was then a Western enclave in Communist Eastern Europe and surrounded by a huge wall with armed guards, ferocious dogs and other lethal devices which prevented anyone from trying to enter the enclave. 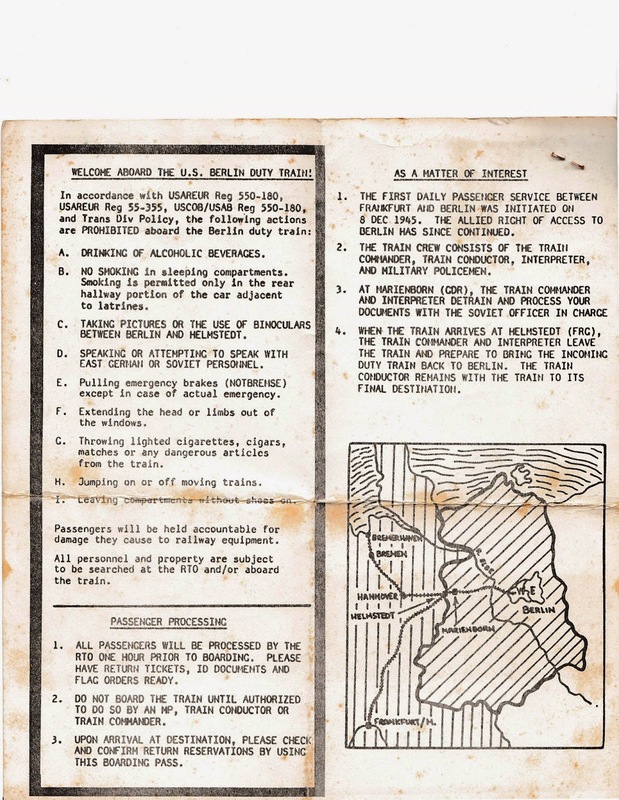 The West was allowed to send in troop trains through designated corridors. The trains were banned from stopping on the way. 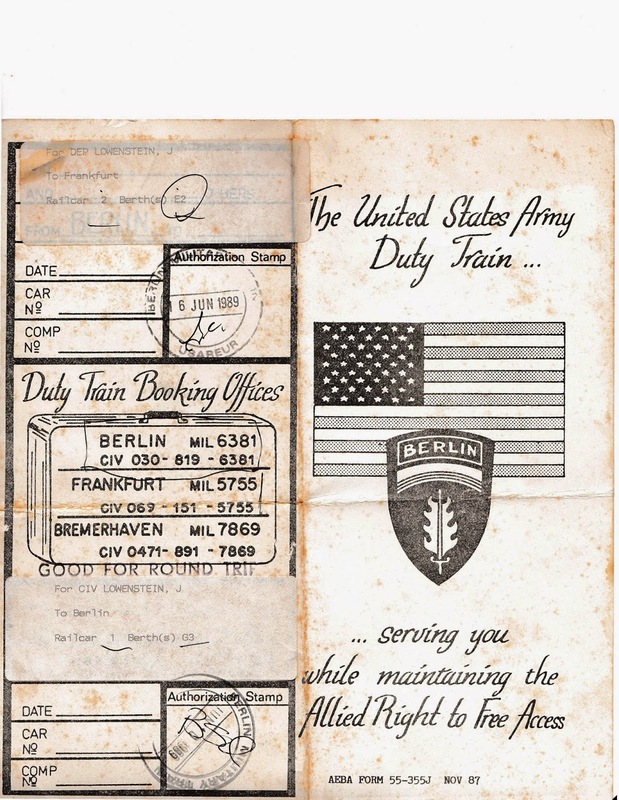 Because my cousin was an employee of the US, I entered on a US military train. I spent a week in West Berlin. Everywhere you went, you sooner or later came up against the vast wall. It was strange that the wall was to prevent those outside from getting in, logically one would have expected it to be the other way round. The Western side of the wall was covered in superb graffiti and there were little platforms with steps, like airplane steps where you could mount and look out across the wall. At some point my cousin suggested I come with him and spend a day in East Berlin. He commuted to work through a border post known as "Checkpoint Charlie" in a car with diplomatic number plates. Checkpoint Charlie was notorious as the most tense border post in the "Iron Curtain". He told me that without the Berlin Wall his 40 minute commute would take 10 minutes. There was a delay as the East German border guards checked my credentials, but eventually they waved us through. My cousin gave me a roll of East German money and told me to meet him at "the Grand Hotel's restaurant" at five. For the rest of the day I wandered around East Berlin. The pubs sold one type of beer, one type of sandwich and nothing else. There was no advertising - anywhere. In a dingy coffee-shop I entered, people sat in clouds of cigarette smoke and pressed their head together to prevent eavesdropping. A food shop sold nothing but potatoes, cabbages and apples. It was very grey. In the main square a miserable looking man sold hot dogs from a small stand, it was clearly not his stand but the product of a bureaucratic decision to sell sausages from a stand. There was very little to spend the money on and it was a drab unpleasant place. The best looking office building I saw had closed circuit cameras on it and little hearts on its railings. "The Ministry of Love!" I thought to myself; in Orwell's 1984 it is the name of the secret service's offices and the cameras (unusual at the time) suggested this must be it. At four I wandered over to the Grand Hotel and found the restaurant, but my cousin wasn't there. I went to the US Embassy which was closed. A voice in an intercom told me my cousin had left. I went back to the hotel but he wasn't there. At this point it dawned on me that I was stuck in a totalitarian country with no visa and a large role of bank notes (tourists were limited to small amounts of expensively priced currency). It didn't look good. I returned to the US Embassy where I was now told curtly to leave and the East German Police guards looked at me suspiciously. By the way, East German policemen were awfully small and unhealthy looking. I started walking back to Check Point Charlie feeling very fearful as it seemed certain I would be arrested for having no visa and illegal currency. East Germany was a notorious dictatorship and I felt scared. I shared my predicament with an American tourist who advised me to go back and "spend my money", which was not sound advice as the shops were completely empty and there was nothing to buy. I decided to make a last try at the hotel but this time I went round to the main entrance which was surprisingly fancy. It had rotating brushes on the floor which cleaned your shoes as you went in. A uniformed clerk rushed up to me ( I looked very scruffy) and asked what I was doing there. I told him sadly that I had arranged to meet my cousin in the hotel but he hadn't arrived. "But we have eight restaurants!" he exclaimed. I felt massive relief and started carefully exploring the hotel. I found my cousin in the fourth restaurant. I suppose it was the only place in East Berlin to eat an expensive meal. He told me that they had fully expected to have to release me from prison. "The pubs sold one type of beer, one type of sandwich and nothing else. There was no advertising - anywhere. In a dingy coffee shop I entered, people sat in clouds of cigarette smoke and pressed their head together to prevent eaves dropping. A food shop sold nothing but potatoes, cabbages and apples." This was pretty much the scenario in Cuba when I visited in 2010. Small state-run shops selling only one kind of everything, no advertising, dingy cafes. It isn't that grey and gloomy however, but that is to do with it being a tropical country.